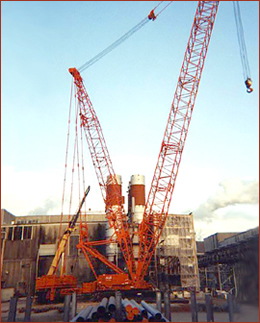 A-Lert’s 30-plus years of heavy rigging experience has encompassed the removal and installation of turbines, boilers, vessels and all types of plant equipment. Whether your project involves just one structure or an entire plant, one small hydraulic crane or multiple models with over 500 tons of capacity, A-Lert’s certified crane operators and rigging teams have the ability to perform your most complex rigging and lifting needs. When warranted, A-Lert has also utilized helicopter services. However simple or complex your rigging project may be, A-Lert excels at providing innovative solutions to complex challenges.